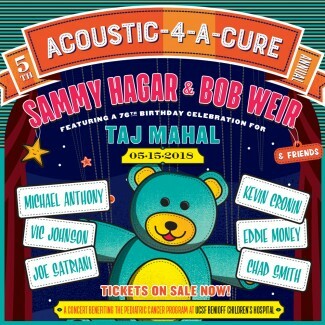 Sammy Hagar and Bob Weir are joining forces for the fifth annual "Acoustic-4-A-Cure" benefit concert on May 15 at The Fillmore in San Francisco. 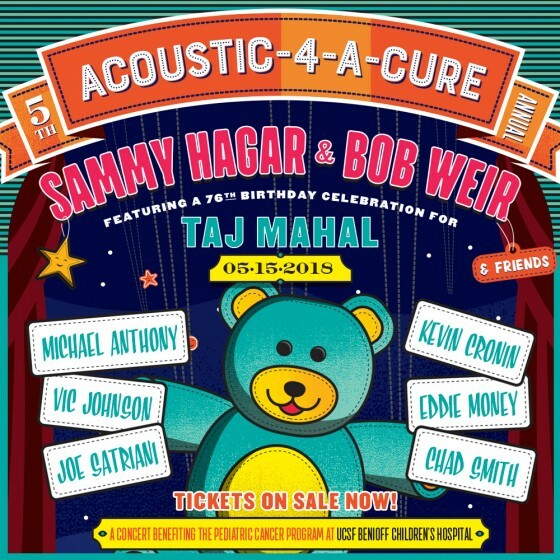 Acoustic-4-A-Cure V will be a special 76th birthday celebration for blues icon Taj Mahal, with artists including Joe Satriani, Chad Smith, Michael Anthony, Kevin Cronin, Eddie Money and Vic Johnson already confirmed to perform. The 2018 concert blends veterans and newcomers to the event, with Bob Weir stepping in to co-host the concert which benefits The Pediatric Cancer Program at UCSF's Benioff Children's Hospital. Check out this fan video from last year where Dave Grohl, Taylor Hawkins & Rami Jaffee Premiered new Foo Fighters song "The Sky Is A Neighborhood"!